Another quick and painless comfort food. Just one pot for boiling orzo and frying pan for chicken thighs. The meat seasoning could be anything that you feel for, like Herbes de Provence, Italian seasoning or just plain ground black pepper, salt and paprika. As usual with poultry and pork I brine the meat for about 4 hours (1/4 cup salt to 2 cups water) and then pat dry on paper towel..
Preheat oven or toaster oven to 350 °F. Heat stainless steel frying pan, add oil and fry chicken thighs skin side down till golden (don’t move them), about 3-5 minutes. Turn over and cook for 3 more minutes. Remove them to pie pan if using toaster oven (my option) or place frying pan in preheated oven on middle rack. (The reason I use stainless steel instead of non-stick is that you will need those brown bits at bottom of pan to flavor the orzo.) It will take about 40 minutes for the chicken thighs to be fall-off-the-bone tender and skin nicely crisp and golden brown with very little fat, if any, left. While the thighs are in the oven start cooking the orzo. Just boil salted water and when at rolling boil drop orzo in, lower the heat and cook for about 10 minutes or so. It should be just al dente, not mushy. Move chicken thighs to another hot pan and keep hot. Drain chicken fat from frying pan and/or pie pan from toaster oven. Add steaming orzo to pan and scrape all the fond (brown bits) with spatula and mix with orzo. Of course, the frying pan has to stay hot at all times. Add green peas and mix till well coated. 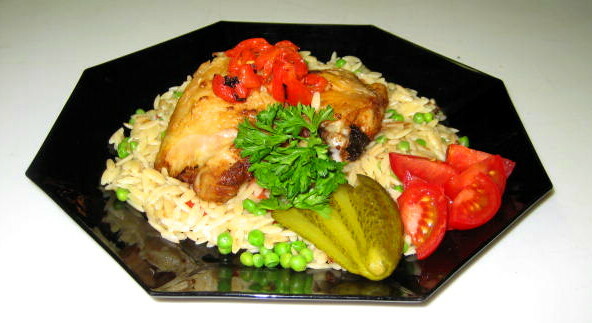 Serve the orzo on plate with thighs on top and garnish with julienned pimentos, sectioned or sliced tomato and lengthwise sliced pickle.